SIMPSON BAY, St. Maarten (Wednesday, December 19, 2018) - Although December 3rd, 2018 was the actual date of the 75th anniversary of the Princess Juliana International Airport, the celebrations were however, deferred to two weeks later to coincide with the official migration of arrival and departure operations back inside the Terminal Building since Hurricane Irma wreaked havoc on the island on September 6th, 2017, causing extensive damage to the building. 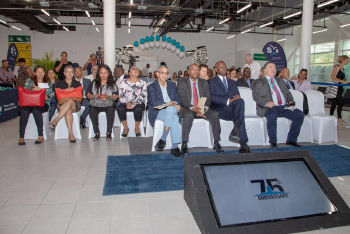 The ceremony was attended by several dignitaries including Governor Eugene Holiday, himself a former president of the airport, and Minister of Tourism, Economic Affairs, Transport and Telecommunications, Honorable Stuart Johnson, who is also the Shareholder’s Representative of PJIAE N.V., the operating company of the airport. In his address, Minister Johnson congratulated the Board, Management and Staff of the airport. He referred to the importance of the airport not only to the island’s economy but also as a leading hub in the Caribbean and cited the many awards it had received over the years preceding Hurricane Irma. He added that these were clear indications that it wasn’t impossible to bounce back to the envious position SXM Airport occupied prior to the monstrous storms that inflicted severe damages on it in September 2017. “In actual fact,” he continued, “the completion of Package 1 - Temporary Operations of the reconstruction project is what we are celebrating today. It includes the roofing project that is now in its finishing stages. I am proud to say that the new roof over our heads is not only state of the art but has been rebuilt to be able to sustain 185 miles per hour hurricane force winds. It is therefore perhaps the strongest of its kind anywhere in the region.” “Where do we go from here?” he asked. “The current advertising spot we have starts with the line, ‘As the eagle soars above the storms, so does SXM Airport soar above adversity.’ That is, indeed, true. Eagles seek new frontiers. They also have a long-term vision and commitment. Our airport, your airport, has adopted those characteristics of the eagle. As we mark our 75th anniversary, we invite you to fly with us above the storms. We are not yet at cruising heights yet, but we will get there. 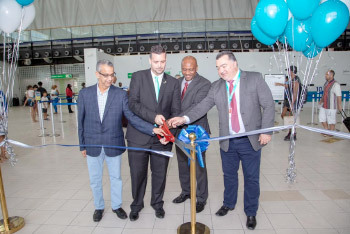 Princess Juliana International Airport will be back where it belongs – at the very top of the aviation ladder in the Caribbean and beyond,” he concluded.